Block crush is all about collecting blocks of the same color. 9 Crush It will clears 9 blocks of the board which is surronding it with beautiful animation. Bomb It will clears 25 blocks of the board which is surronding it with beautilful animation. ThunderIt will crush entire vertical column or horizontal row of blocks in one tap with wonderful thunder animation. Color bomb It clears all blocks of the same color. It will helps you to complete level very quickly and entertain you by beautiful animation. Classic Crush the block of the same color by tapping one of them if they are in a block of 3 or more. A block can be formed in minimum of 3 blocks. Coins are introduced on board when certain amount of bubble are crushed. You will need to set out the coins at the slots to clear the level. Clear All You will need to clear the board by crushing all blocks. Bombs are introduced to help you clear the level which would crush all the blocks surrounding it. Filled Complexity will increase as the new blocks will get filled from bottom and you would need to make hurry to finish the level. If the blocks reaches to the top, you are gone. Bombs will help you often to clear out the level. 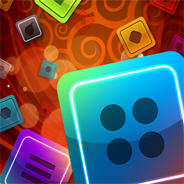 No time limits to complete the level but instead some number of blocks are crushed and you are move to next level!